By far my most read category of books is Cozy Mystery. I can read them in 1 to 3 days usually, and I love the variety out there for me to choose hobbies, interests, and fun to go with a murder mystery. They are hard to review in that I read them so quickly I feel that it is easy to discount the work the author put into the book. However, I made this blog to share the books I am reading, so here it goes. In my desire to calm down and read I grabbed some Cozies off my wishlist at the library, and chose this one because it is An Embroidery Mystery. I love to cross stitch, so the idea of hearing about embroidery and cross stitch throughout the book appealed to me. 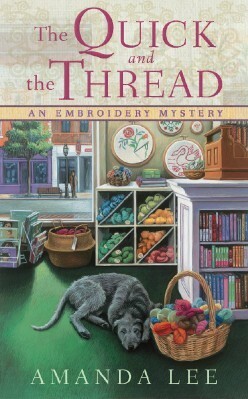 The cover also actually made it easy to choose: large dog, books, yarn, puns. It is all my type of book. If you are into cozies, read this one, too. The only negative to this story was the motive. I am not enough of an adult yet to understand much about real estate and finances. So, the main conflict of mortgage fraud of some kind was confusing to me. I kept thinking, “I should go look this up,” but as I said, I read the book too fast for that. So, before you read it make sure you know what straw buyers are as they relate to fraud. This is the first book in the series, and I immediately liked the main character and her friends. The love triangle was disappointing only because I liked both the guys introduced, and while I knew who I wanted her to choose, I wanted the other one to just be a friend. That seems unlikely with his determination to get her to like him. I did predict the end (which is my thing, so it shouldn’t detract from the book for you), but I had my doubts all the way until the reveal. That is a great bit of writing. Usually I know who did it for most of the mystery, and I just enjoy seeing who figures it out and how. This time I was right there in with them suspecting everybody. Amanda Lee had a great way of writing to cast suspicion on others. Especially since we were just meeting the characters. An important piece of a Murder Mystery review for me is to share with you the gore level. There was nothing truly disturbing in this beyond the dead body being found. If you have an active imagination there might be times that you can get a thrill, but nothing is described to the point of disgust or disturbing, which is a very good thing for me. I enjoy the mystery, the relationships, and the relative peace in reading the book, so I don’t need the blood and guts. Publisher: Obsidian, an imprint of New American Library, a division of Penguin Group (USA) Inc.